The Garden Party cake stand is quite tall at over 18 cm high. 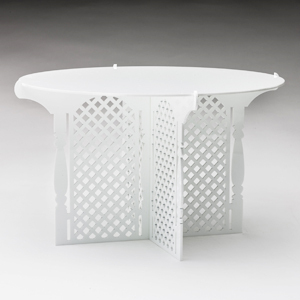 The Garden Party cake stand is quite tall at over 18 cm high and will comfortably hold a 10 inch cake. It makes quite a statement with its detailed lattice work flanked by old world arches. Our flat-pack design means it can be assembled and disassembled in a flash and stored flat to use again and again. Cut from sturdy 3 mm acrylic, it comes complete with a clear acrylic stabilising bottom disk. Assembled dimensions: height 18.5 cm; width 30.9 cm; top plate diameter 29.5 cm.